FNR Designs produces a wide variety of custom machined parts and pieces in our shop in Geary, NB. Handcrafted from select chunks of local dead tree carcass, lovingly carved by our hand-built CNC mill, and then hand-finished to produce individual works of art. No two pieces are the same! These make great posting gifts or retirement gifts! It's a fine day to be a Dragoon! 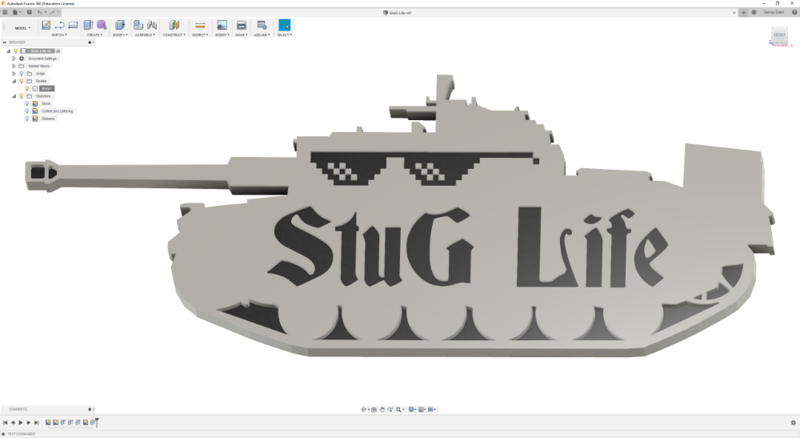 Show some regimental pride with the regimental toast superimposed on a Leopard 1 tank outline. Usually made from ash, these pieces show a lot of grain and really pop. $85 CAD + $20 CAD shipping (Canada Post XpressPost) anywhere in Canada. 3 left in stock! It's a fine day to be a Dragoon! Show some regimental pride with the regimental toast superimposed on a Coyote outline. Usually made from ash, these pieces show a lot of grain and really pop. $85 CAD + $20 CAD shipping (Canada Post XpressPost) anywhere in Canada. 1 left in stock! For World of Tanks fans, I have some designs for you too! Coming soon! If you are interested in one of these pieces, let me know at RecceDG@gmail.com. Work gets prioritized based on who is looking to actually buy something! We do custom work! (Some of which I can't show because the recipiants haven't got them yet). If you are interested in custom work, drop me a line at RecceDG@gmail.com and we'll figure something out. We don't just do artsy-fartsy stuff - a lot of what we work on is high-tech mechanical engineering. This isn't my day job (as I'm sure the website quality makes clear). I'm still serving, and the demands of the Queen take priority over all else. It takes time to source wood, prep it, and the actual production of pieces is still suprisingly labour-intensive - especially if I want to keep quality where I like it. Accordingly, stuff gets done when it gets done. If you have a hard deadline, make sure you let me know, and I'll try and hit it (especially if the piece is a Depart With Dignity or Posting gift) but all deadlines and stock levels are on Afghan time. I'll do it, inshallah! Payment We use PayPal to take credit cards. I'm still learning how the PayPal stuff works. It should track inventory and be clear about shipping and so forth.